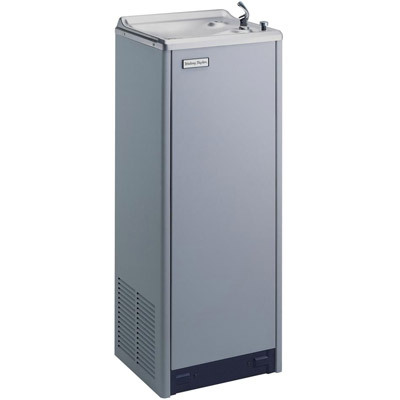 The Halsey Taylor SCWT8A-WF-Q Water Cooler is an electric, refrigerated free-standing unit. Delivers 8.0 GPH of 50°F water at 90°F ambient and 80°F inlet water. Fountain has stainless steel basin with removable drain strainer. Bubbler is chrome plated, two-stream, mound-building type. Separate valve and automatic stream regulator can be mounted within cabinet. Refrigeration system employs high efficiency, positive start compressor using R134A, non-pressurized tank with totally encapsulated insulation and be controlled by positive sensing thermostat. Unit is certified to NSF/ANSI 61 and meets requirements of the Safe Drinking Water Act. Unit complies with ARI Standard 1010. Equipped with the Water Sentry HWF172 lead reduction system which is designed to remove cysts, such as cryptrosporidium and giardia, lead particles and chlorine taste and odor. The filter has been tested to the following NSF International standards: NSF/ANSI Standards 42 Chlorine, and Taste and Odor. NSF/ANSI Standard 53 for Reduction of Lead and Cyst. Features include Quick-Disconnect, 1/4 turn installation. Automatic inlet shut-off valve that closes when filter is removed. High-grade filter is made with activated carbon and patented ATS lead-removal media. Cap and housing shall be made of rust and corrosion free plastic. Filter should be replaced every 1,500 gallons (5678 liters) or approximately one (1) year after installation. Use part # 55897C when ordering replacement filter. Non-corrosive stainless steel cooler top, number 300 series with satin finish resists stains and corrosion and is easy to maintain. Anti-splash design reduces splatter. Contoured to insure proper drainage. Hermetically sealed, positive start compressor with lifetime lubrication and built-in overload protection, efficient capillary sizing, large capacity dryer-strainer, and self-lubricated fan cools copper/aluminum condenser. System uses R134A refrigerant. Protected by Halsey Taylor's Limited 5 Year Warranty. Positive sensing thermostat for controlling temperature of storage tank water. Factory set at 50°F Adjustable +/- 5°F. Non-pressurized stainless steel evaporator/storage tank for long life. Waterways are certified to NSF/ANSI 61, far exceeding the requirements of the Safe Drinking Water Act. Insure proper ventilation by maintaining 6" (152mm) minimum clearance from cabinet louvers to wall.